Log shipping is a low cost technique for disaster recovery solution which you can setup on primary server database and one or more secondary server databases. This is basically a three step process backup, copy and restore involved in to configure log shipping. 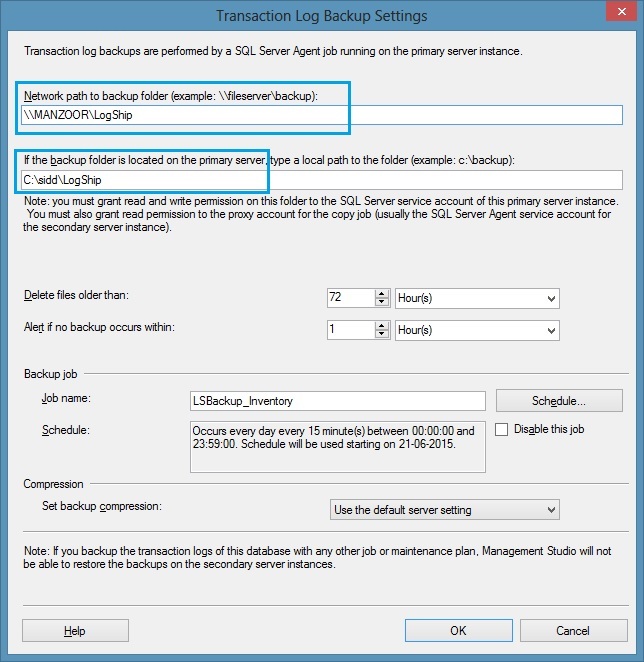 Once this technique is implemented it will automatically backup the transaction log on primary server as per job schedule then it will copy the transaction log on secondary server and finally it will restore log backups. You should have sysadmin rights on the server to implement log shipping and read write permission on folder involved to hold transaction log. It is better to have same version of SQL Server on both side of primary and secondary server so that you can do manual failover. You can do failover from lower version of SQL Server to higher version of SQL Server but reverse is not possible. Also your database must be in full recovery model or bulk-logged recovery model to configure and implement log shipping. 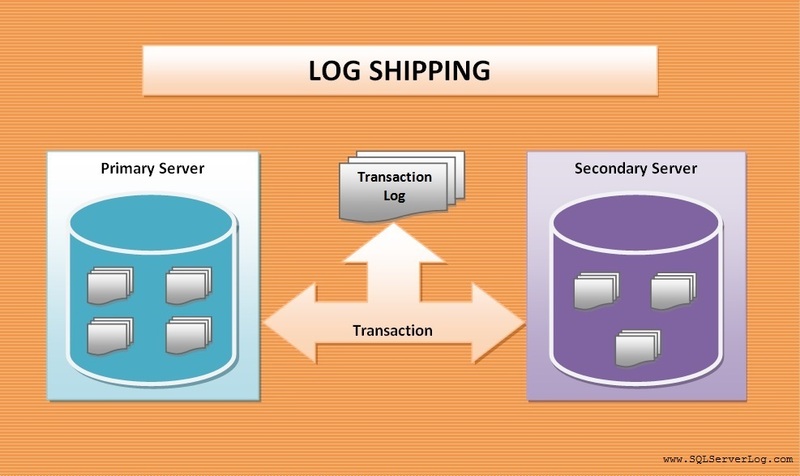 Now we will see step by step process how to configure log shipping in SQL Server 20012. For demonstration purpose I am going to use ‘Inventory’ database. First of all verify if your database recovery model is full or bulk-logged with below query. If it is simple recovery model then alter the same with below query. 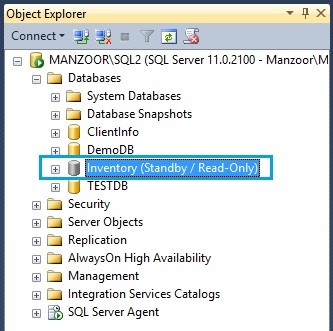 On primary server, right click on ‘Inventory’ database and click on Properties. Make sure that you have assigned read and write permission on this folder to SQL Server service account then click OK. 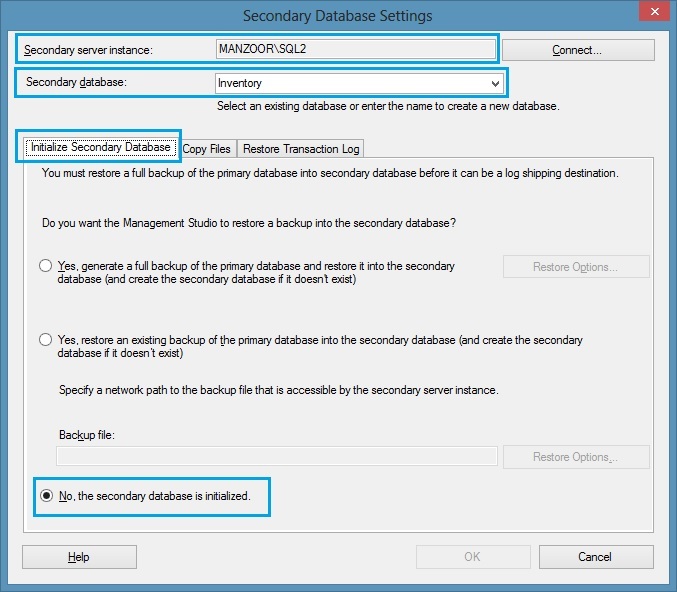 In next step you have to map secondary server instance and database so click on Add button in secondary databases option and you will get below screen. Now click Connect… button to map Secondary Server Instance and Database. On this page, you have to configure three tabs which are enabled as given below. Now in Copy Files tab, specify destination folder for copied files i.e. you can mention network shared folder path then select Restore Transaction Log tab. 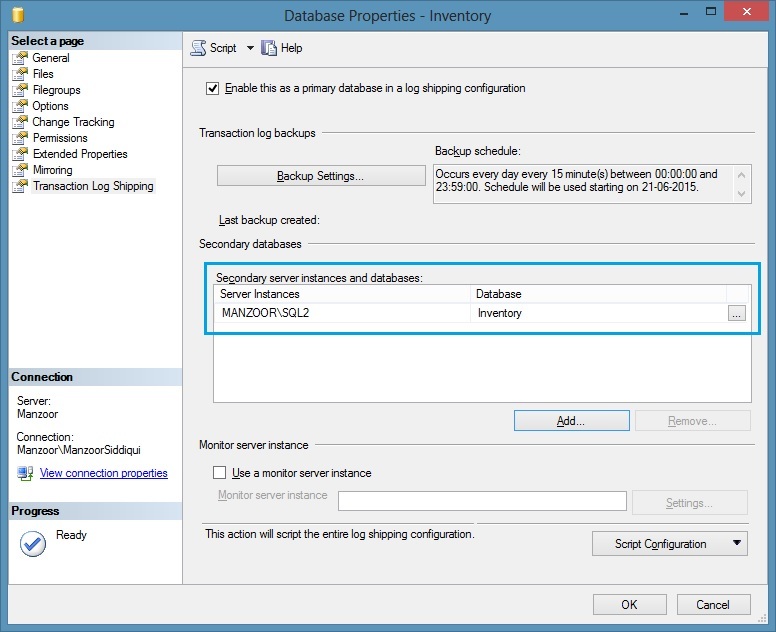 Choose Standby mode in database state when restoring backups and select ‘Disconnect users in the database when restoring backups’. Now click on OK button. It will create a job to restore transaction log. Once you will click OK our configured settings will be saved and scheduled jobs will be created. You can verify the log shipping configuration details by executing below query. After successful log shipping configuration multiple jobs are created on primary and secondary server instance. You can verify the jobs from SQL Server Agents node. Finally as per job schedule all the transaction log will be copied and restored to our secondary server database. You can insert some records in Inventory database tables and verify the same. If you want to configure log shipping by T-SQL then you can do the same by following below steps. 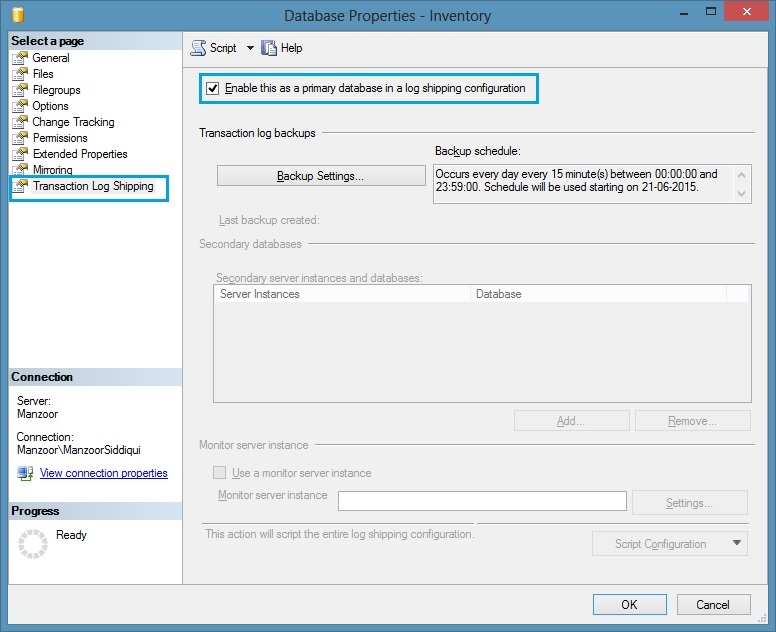 – Take Full Backup of database from primary server database. 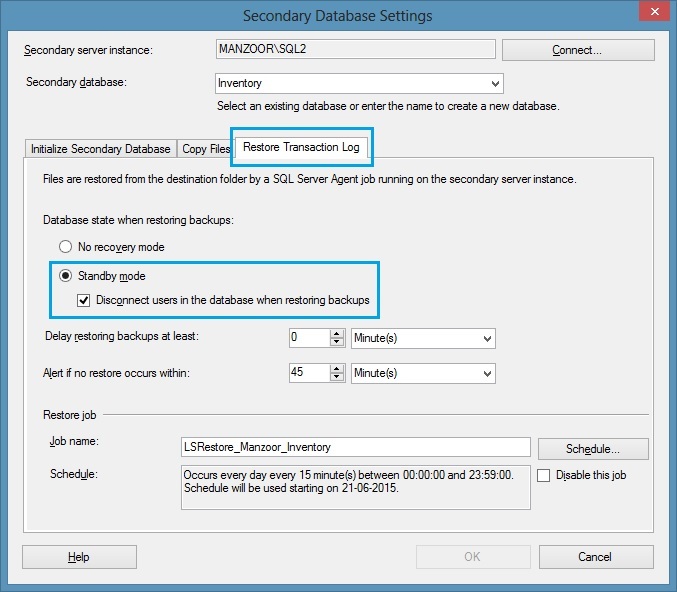 – Restore database on secondary server in standby mode. – Execute below query on primary server under master database so that it will setup and create required jobs on primary server. 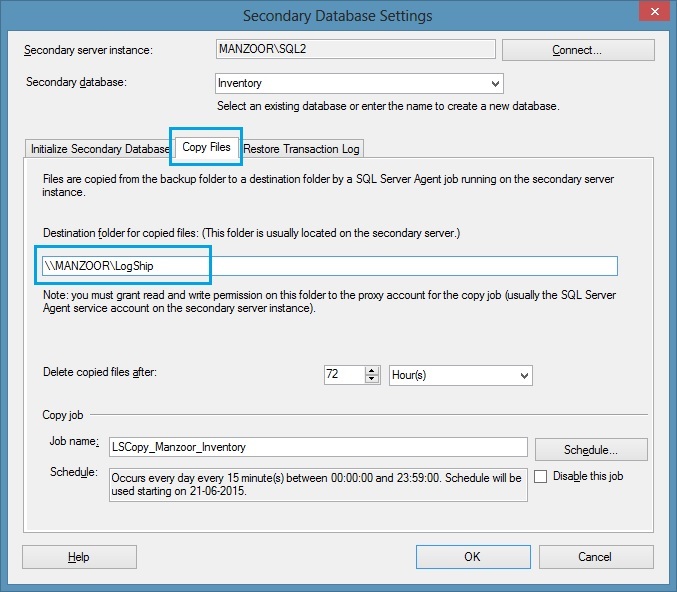 Now execute the below query on secondary server under master database so that it will setup and create required jobs on secondary server.